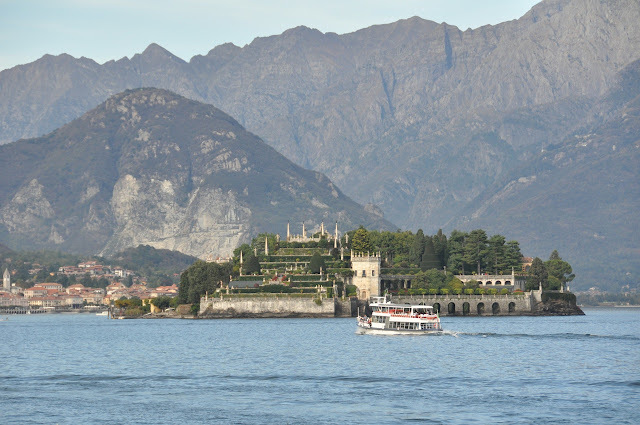 Stresa is a very scenic town along Lake Maggiore in the lake district of Northern Italy. The two lakes (Orta and Maggiore) are actually very close, but are separated by the Mottarone mountain and we needed to 30 minute drive from Orta San Giulio where we were staying, up north and around the mountain before coming back south along Lake Maggiore to Stresa. The two lakes couldn't be more different. Orta gives the sense of quiet serenity, with its still lake and the monastery of silence being the stark centerpiece. Maggiore on the other land, is significantly larger and is teeming with tourists. There are many small towns lining the lakeside of Maggiore, and the areas near and including Stresa have large hotel properties. Hence, large tour buses and long lines of tourists are not uncommon during holiday season. In many ways, Maggiore is similar to Como. We had planned to eat at a pizzaria which was recommended by someone in Chowhound, but unfortunately, it was closed that day. Our second choice, a seafood restaurant 10 minutes drive south of Stresa, was also closed (it was a Tuesday but unusually many restaurants were closed). So we drove back into town, walked around a bit and ended up in a small but rather serious looking restaurant called Ristorante Piemontese which is located at the centre of town. 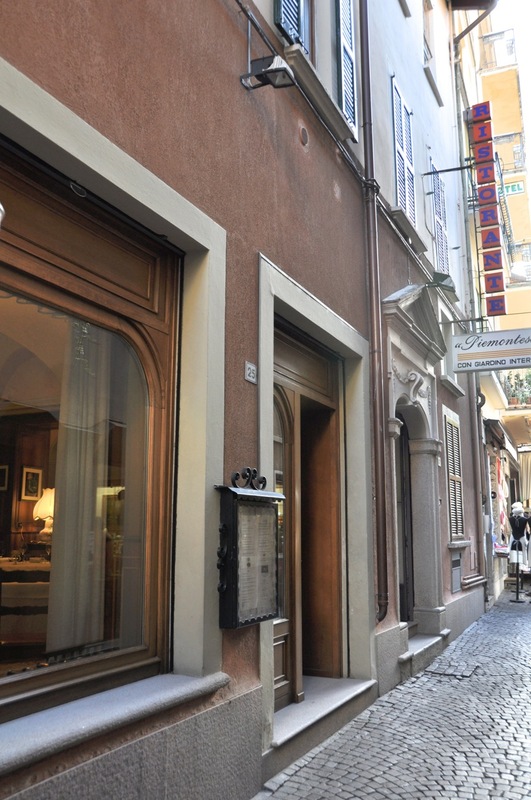 The restaurant specializes (which we could gather also from its name) in Piedmontese cuisine and looked like it could be a rather formal dining place at night. 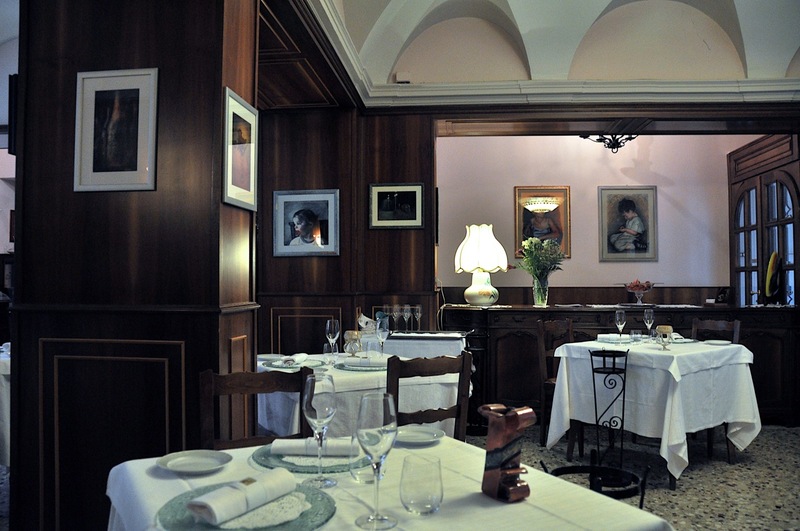 But in the day it was relatively quiet with only 2 other tables of elderly Italian and American couples having their lunches (there are a lot of elderly tourists in Stresa - we felt absolutely juvenile in contrast). There was only one server (and he was always in the kitchen) so service was a bit slow but we felt like a laid-back lunch anyway so weren't too bothered. They had a good wine list concentrated in the Piedmontese wines like the Barolos, Barbarescos and the lesser varietals, but it seemed rather expensive for a small town (albeit tourist town). We decided to have a glass of Barolo each instead of having an entire bottle (big dinner that night). 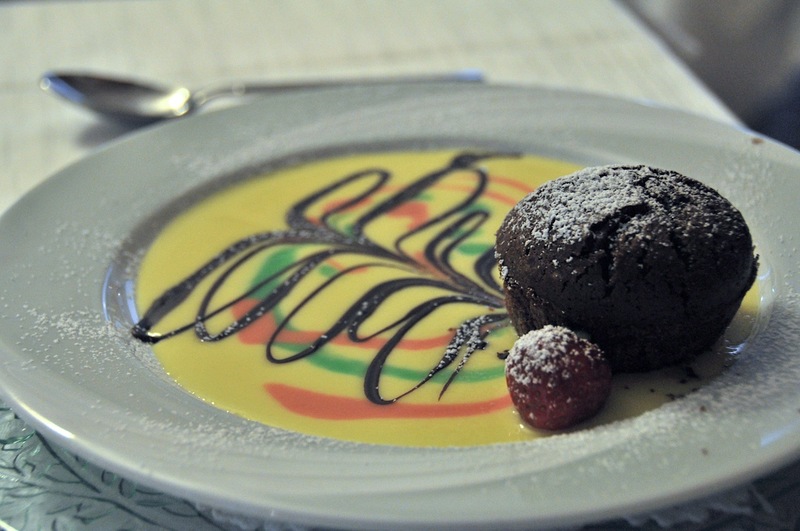 The menu was very traditional and there wasn't anything innovative or unusual, which suited us since we just wanted some familiar Piedmontese dishes. 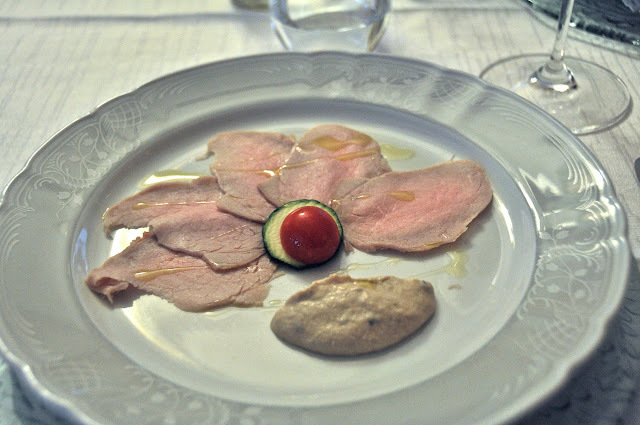 We started with the Vitello Tonnato, which was prepared in a much simpler manner that the one we had at dinner the previous night at Il Sole di Ranco. In truth, we preferred the simpler version at this restaurant compared to the more elaborate one at the 1 Michelin star restaurant. Our next dish was an old favourite, the ravioli del plin (hand-folded small ravioli made with homemade pasta and stuffed with meat, usually veal), a regional speciality. 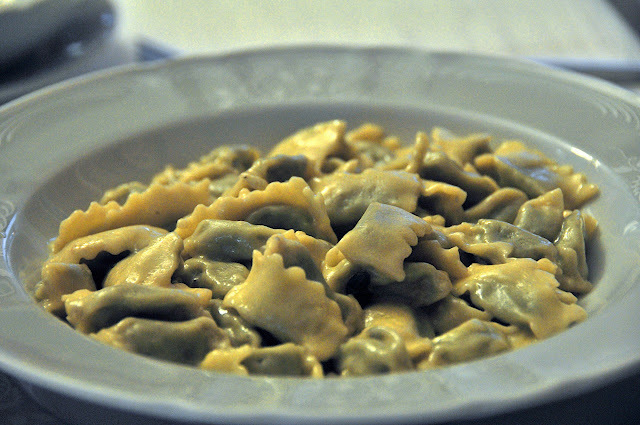 You don't get plin anywhere else as good as you get in Piedmont. It was as good as we remembered it. We also had the gnocchi with hazelnut which was also brilliant. 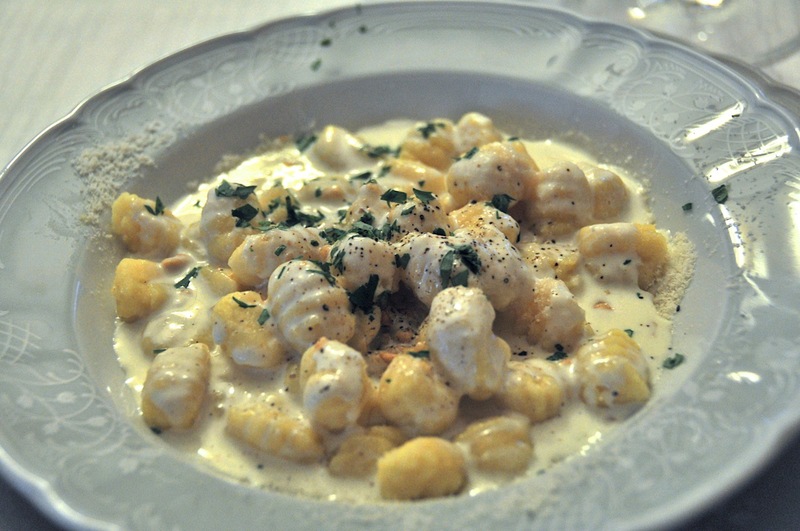 This was potato dumplings with lots of cheese and ground hazelnuts which added a layer of complexity to the otherwise creamy and cheesy pasta. Dessert was a warm chocolate cake which was very nice (albeit unspectacular). Final Thoughts: Not a destination restaurant but decent choice if looking for traditional Piedmontese fare while in Stresa and not wanting to eat at the more casual pizzerias. Food was reasonably good though its more formal setting is reflected in its relatively high prices.